Chorten in Barle Village Dolpo, Nepal. Photo credit: Geshe Nyima Kunchap Rinpoche. 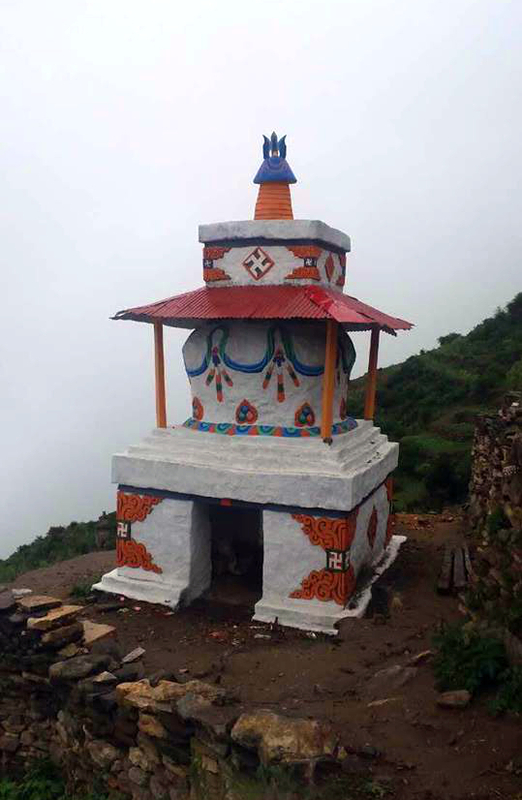 In the village of Barlé located in Dolpo, Nepal and approximately 185 miles from Kathmandu, a new Yungdrung Bön chorten (Sanskrit: stupa) has been erected by Murig Geshe Nyima Künchap as a gift to the village residents. The chorten is located near the Barlé gompa. From July 22nd to July 28th, Geshe Künchap Rinpoche will perform the full consecration of the chorten. Inside the chorten above the doorways, it is ornately painted with sacred Yungdrung Bön images. In the four directions, are the Four Principal Enlightened Ones: Satrik Érsang, Shenlha Ökar, Sangpo Bumtri, and Tönpa Shenrap. As is traditional, each of these enlightened ones is surrounded by two hundred fifty Buddhas for a total of one thousand Buddhas. 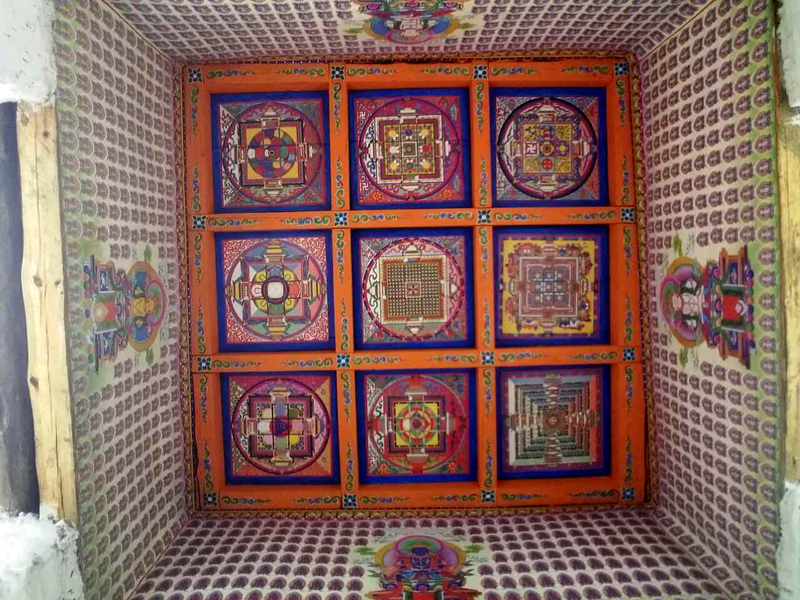 (For more information about the Four Principle Enlightened Ones, see previous post: https://ravencypresswood.com/2016/08/20/the-four-principal-enlightened-ones/ ) On the ceiling above are nine mandalas whose purpose is to act as an appropriate dwelling place for the related enlightened qualities. In the center is the mandala of the Sutra of the Indestructible Vast Expanse (Tib. mdo g.yung drung klong rgyas). Then, beginning in the East (middle left) and continuing counter-clockwise, are the mandalas of: The Peaceful AH that Clears (Tib: zhi ba a gsal), Red Garuda (Tib: khyung dmar), The Stages of Walsé (Tib. dbal gsas las rim), the Great Mother Jamma (Tib: rgyal yum byams ma), Complete Space (Tib: Kun dyings), the Precious Lamp of the MA TRI (Tib: ma tri rin chen sgron ma), Shenrap Nampar Gyalwa (Tib: gshen rab rnam rgyal), and The Lamp that Purifies Obscurations and Removes the Darkness (Tib: sgrib sbyong mun sel sgron ma). Murig Geshe Nyima Künchap Rinpoche was born in the village of Barlé and spent many years as a student of his root lama, Barlé Rinpoche. In 1982, he received ordination as a monk from HH 33rd Menri Trizen and HE Yongdzin Tenzin Namdak Rinpoche. 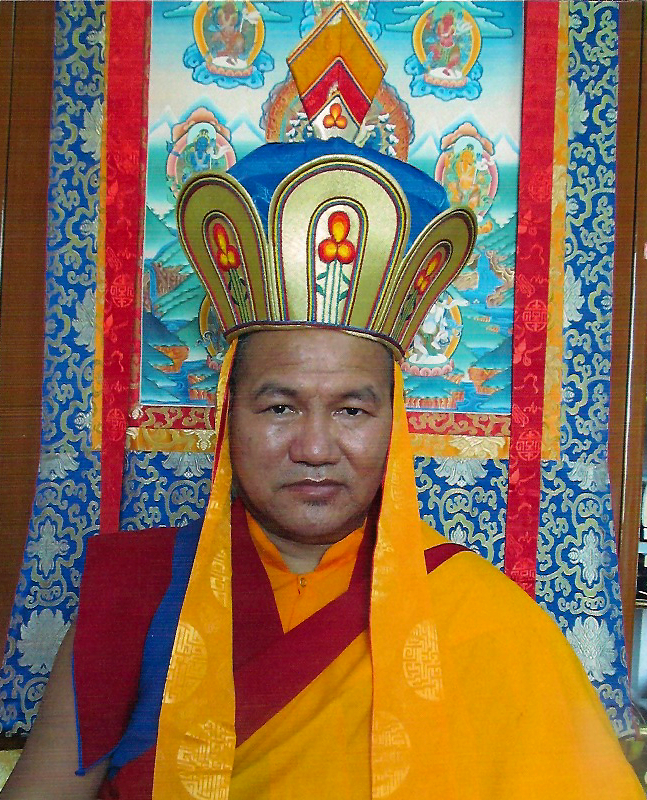 In 1994, after many years of rigorous study, he received his geshe degree from Menri Monastery. He is a master of sutra, tantra, and dzogchen. However, he is considered a ritual specialist. Of the 360 rituals given by the Enlightened Lord Tönpa Shenrap Miwoche, it is believed that only 68 remain. 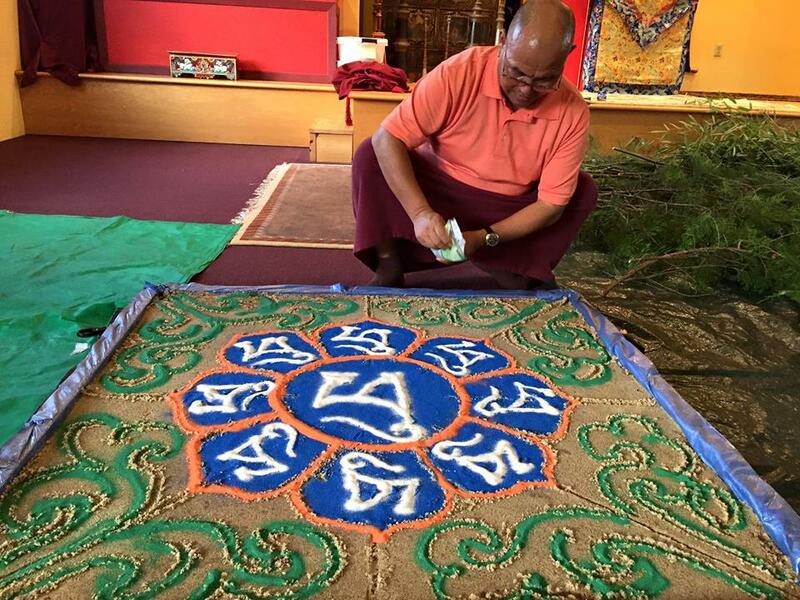 Geshe Künchap Rinpoche holds the transmission, empowerment, and teaching for each of these 68 rituals. Posted on July 21, 2018, in Dolpo, Nepal, Preservation, Uncategorized. Bookmark the permalink. 2 Comments. Thank you for this beautiful background on Geshe Nyima Kunchap Rinpoche.